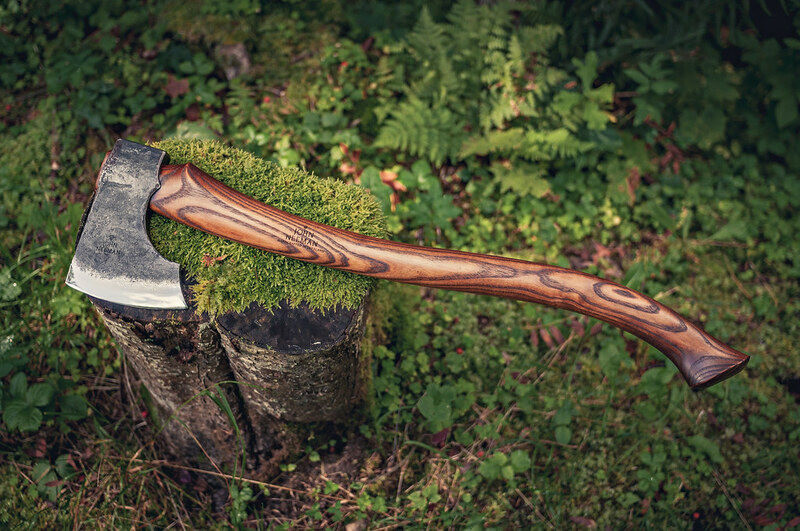 Damascus Woodsman Axe. Bog Oak 5600 yrs. Scandi Leuku knife. Bog Oak 5600 yrs. Longbow Hybrid "Buzzard The Hunter"
Due to the overwhelming worldwide demand we have placed Axe orders on reserve at this time. That means that we will not send out for the usual 50% invoice we normally require until we are ready to begin forging your axe. Wait times are between 12 and 18 months for Axe orders. Your Reserve Order Date is used to determine the beginning of the wait time. Once your turn arrives we will send you a deposit request for 50% of your order. When that is paid then we will move your order from our Reserve list to the Craft list and we will begin to craft it for you. Thanks again for placing an order with us and we look forward to sharing our craft with you soon. 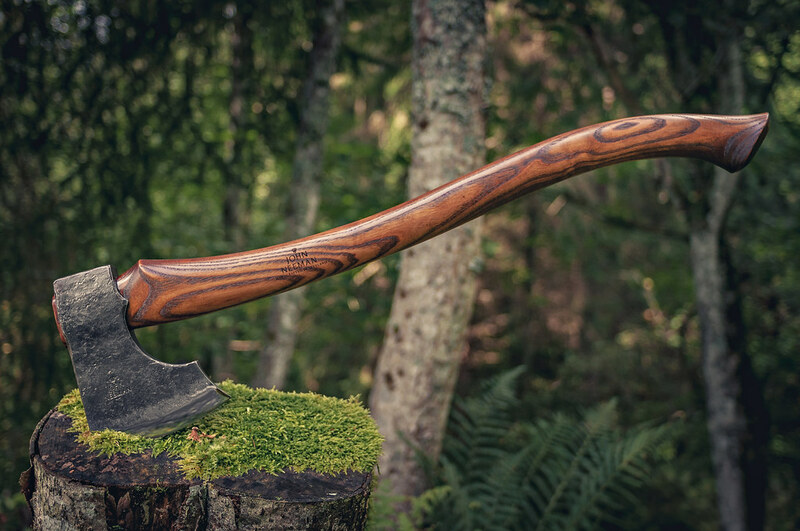 The Northlander Forest Axe is one of the most universal axes. The long handle and large blade length allow power strokes on limbing, felling, splitting and other bushcraft needs. Yet, it is light and small enough fit well on camping or hunting trips where space is limited and can be used one handed without fatigue. 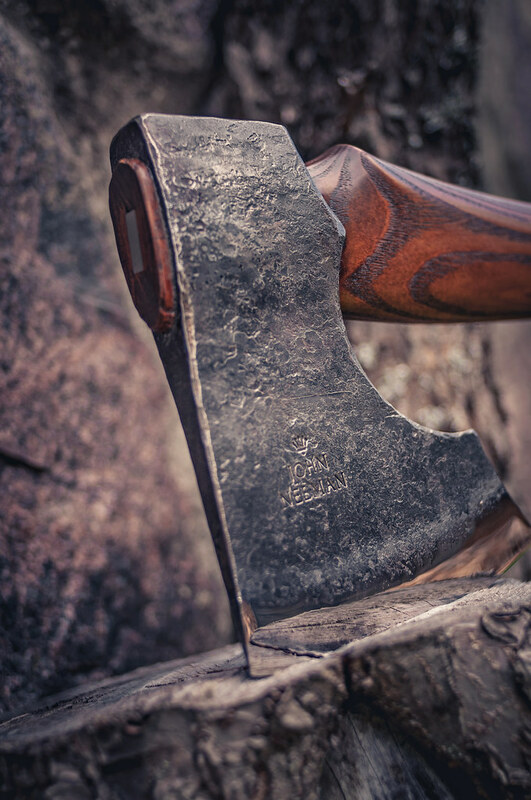 The Stalwart is also a good craft axe for timber framing and carving needs around the shop or in the woodlands. 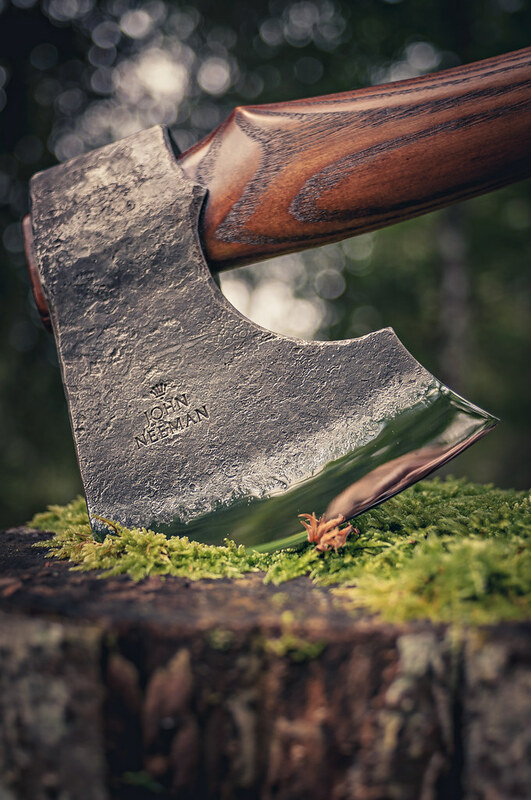 The first step in axe making is to chisel a hole in a block of mild low carbon steel. This is where the eye will take place. Using a mandrel the eye is stretched into the needed size. Next a notch is chiseled in one end of the billet and a wedge shaped piece of alloyed Bohler K460 tool steel is inserted in it to form the harder cutting edge. Now the axe is heated to a dark yellow color and borax is sprinkled on it. Melted borax liquefies the oxidation scale and washes it out of the welding seam. Once again the axe is heated, this time to a bright yellow glow, and forged so that the two pieces of steel forge weld together. The blacksmith then forges the axe’s head into a shape and grinds the rough edge. Now the axe is ready to be annealed. Annealing is needed to remove the inner stresses in the steel formed during the forging. 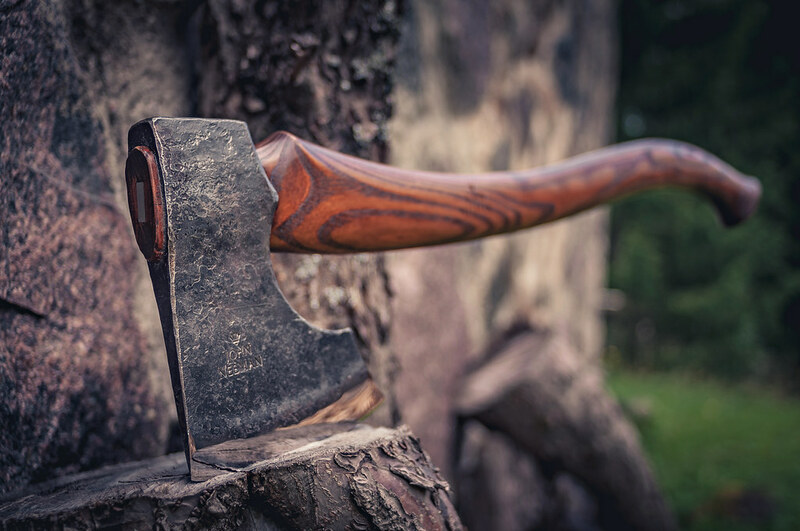 To do that axe is heated to 850 degrees Celsius and cooled very slowly to room temperature. After that the axe goes to second heat treatment step which is normalizing. For this the axe is heated again, this time to a 800 degrees Celsius, our makers mark is stamped into the steel and the axe is cooled down in the air. Normalizing prepares the structure of the steel for the next step; hardening. Again the axe goes into a furnace and is heated to 800 degrees Celsius. Then the axe is quenched in mineral oil and water. Now the axe is hard enough, but is very brittle so it needs to be tempered. For the last time the axe is heated to 220 degrees Celsius, and is held at that temperature for one hour. After the axe is tempered to Rockwell 58-59 (HRC) and the steel is hot enough, a mixture of bees wax, linseed oil and turpentine is applied to the axe head. This is a very old and effective way to protect the tool from rusting. After final smooth grinding and polishing the axe blade, it reaches mirror finish, becomes razor sharp and is ready to get its own unique handle. 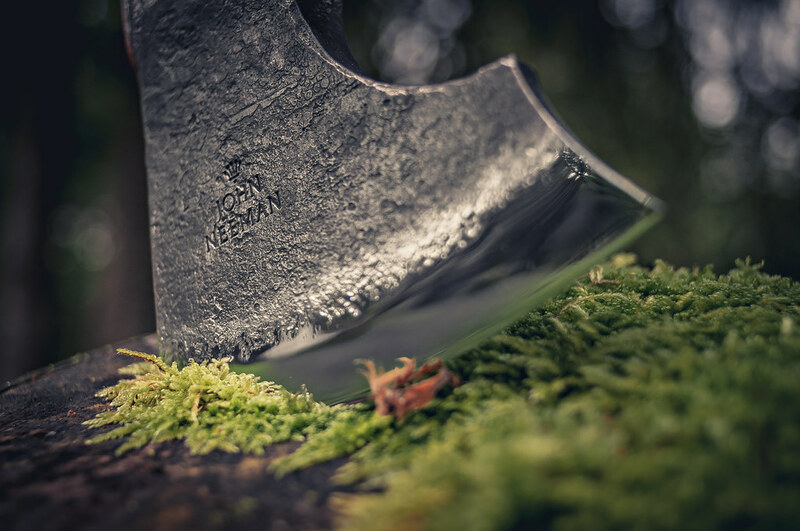 Each axe handle is made individually for each axe head to achieve a perfect fit. To start, a knot-free piece, of locally harvested and kiln dried (6-8% of moisture) Red Elm wood is chosen and then marked out using a template. 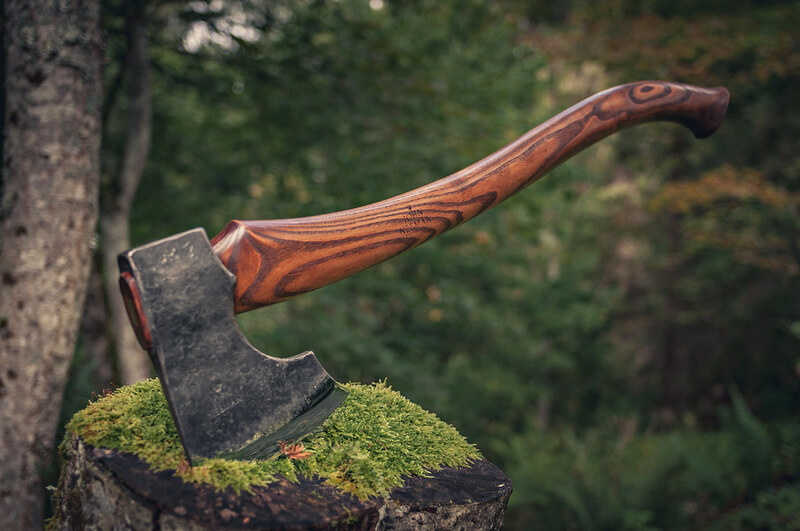 We use only parallel grained wood to the axe eye, if the grain of the wood will be perpendicular to the axe eye - it will break fast and will not last long. The rough shape of the handle is sawn using a bandsaw. Next the handle is shaped using a drawknife. Axe eye dimensions are marked on the top of the handle and the handle is shaved to almost fit the eye. Final finishing is carried out using sandpaper to ensure a close fit. Then the axe handle is tightly punched into the axe head and locked with the wooden wedge which is glued in with an epoxy wood glue. 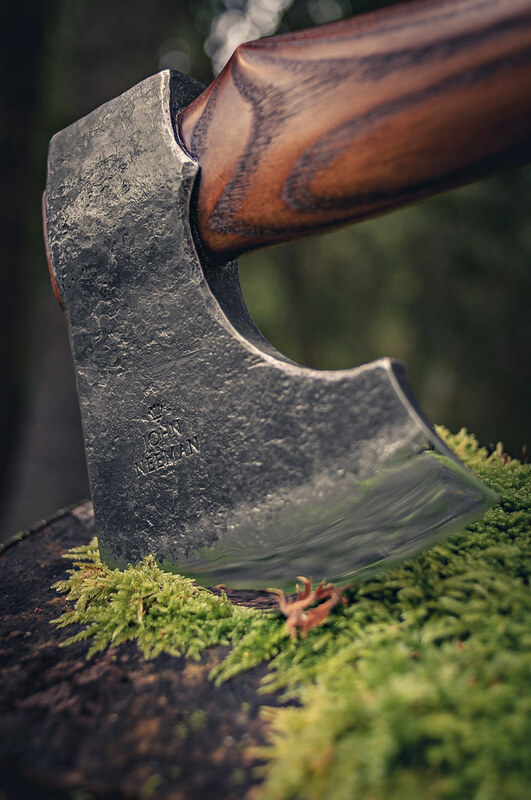 A small steel wedge is hammered into the wooden wedge to lock the axe head vertically. Now the axe has been laid in the Tung oil bath for 24 hours, this fills the wood pores with the oil, and swells the handle so after a week the oil dries and polymerizes and wood is fully protected and it will never shrink. Like our other leather goods, the axe sheath is made from cowhide that's manufactured in a local tannery using the same methods and techniques that were used 100 years ago. 4mm thick leather is dyed with Fiebings professional oil dye. Afterwards, the leather is treated with palm leaf wax and heated beeswax that gives it a vintage look and protection. As final finish Fiebings Acrylic resoline is being applied.